Using baby towel "Mother's milk towel"
"Milk Tissue" is a nickname given to the baby when giving birth to a baby girl to remember the "triumph" of neonatal care and the selection of unique baby products to help prevent the baby. skin and respiratory diseases, ensure the health of your baby. That is the secret and the way that I experienced new experience. Recall that day, to prepare baby for birth with dozens of jobs, including the choice of towel brand, sort of towel to wipe people, towel to clean their face when eating, washing and preserving towels. It also takes up all of my time. My baby is 2 years old this year, steals her baby healthy, active and rarely sick. Looking at the baby wisdom to remember the time to do "milk mothers", say super pole, but happy and happy. Today, I share with the "milk towel mother" the future of a few tips on how to choose how to buy, use and preserve baby milk towel is reasonable. Priority # 1 is to choose a branded milk towel. Choose Mollis towel, because the towel of this side has many sizes to choose, with the famous brand, clear origin, the material should be used also peace of mind. On that day I used a double layer bamboo towel, a bag of 10 towels, sometimes using 20 towels. 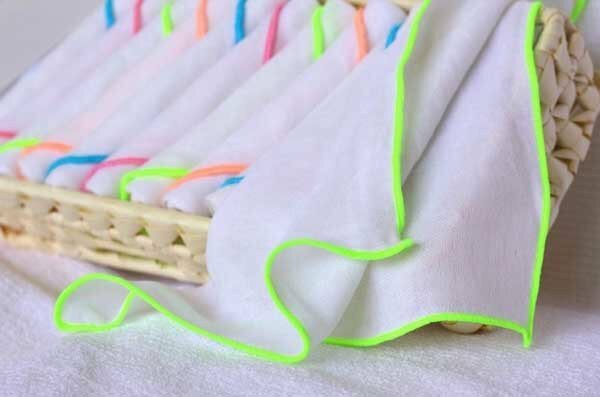 This towel is made from bamboo fiber with nano structure so the towel does not dry as hard as cotton towels in the market, while the material has natural antibacterial properties to help prevent skin diseases and respiration for baby. To say good use and feel good quality. According to her, the mother should buy at the same time many scarves with different colors to differentiate easily. For example, pink towel to clean the baby's mouth, golden rim to wipe the buttocks, sanitize every time baby pee, and large green towel to bathe brush for children. The doctor advised that under 3 months should use a moist towel (put in warm water) to wipe the baby is best, drill with a wet towel once and then dropped because at this time baby skin is very sensitive, Use a 100% non-woven cotton towel to protect your baby's delicate skin. Mothers prefer to buy more sizes of milk towels for use in more jobs. As small sized towels replace breastfeeding with breastfeeding or bottle feeding, or when baby loves to sleep, use a milk towel to cover the breast and neck of the baby to sweat very well, and keep. baby warm up A 70x75 size towel is used to wrap baby or to bathe baby after bathing. Stolen the little angels that day very good, less startled or crying night, probably also because of Mollis soft towels too? To tell you the truth is that many times you hand out the towel in the Mollis towel case to wipe your head first and after breastfeeding with a bra in the milk, there is a smooth mollis smooth and smooth mother. According to her find out Mollis is a brand of high-grade towel of Phong Phu Corporation, the company should also use big peace of mind. Once we visited Phong Phu to visit the production line is really monumental, the stage is very tight and closed control from A - Z. The system is automatic full automatic recognition of real. 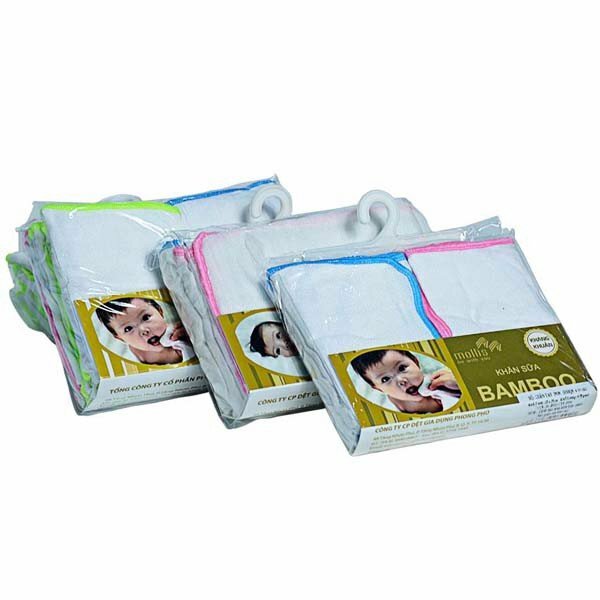 In addition to the usual Mollis towel, the Mollis range of baby products is made from solid, solid fibers that are sensitive to baby's skin ... and mother's after birth too. Many other baby products. The mother who is looking to buy a good towel that do not know where to go to http://mollis.com.vn refer to offline. In the case of a baby towel, mothers should wash their hands and lightly rub the rash with a towel. If stains are stubborn, before washing, soak the milk towel into hot water 500C for about 30 minutes, then wash by hand, the towel will be as white as new. Limit use of bleach because the smell and the substance in bleach affects the delicate sensitive baby's skin. After washing, it should be exposed to the sun to always clean and clean bacteria. In addition to the arms of the parents, cloth milk contact with the delicate sensitive skin of children love the most so the choice to buy and preserve milk towels need to be considered seriously. Choosing a towel of clear origin, using the right towel, washing towels often is the secret to care for her baby. Future mothers try hard, all for your health, small things like this will be a solid foundation for your development tomorrow.